This review and more at Sab The Book EaterI'm not very fond of paranormal novels that don't have a lot of contemporary elements in it (i.e. names, you're-in-highschool-but-actually-you're-a-powerful-warlock etc etc) so I originally had trouble getting into the story. But once I read a few pages and the backgrounder was there, BAM! I couldn't stop reading and I felt really awful that it was kind of short.I really liked how imaginative the author was. Everything about the world she created was really detailed and it was a real page turner! I liked how the story was action-packed and how the action scenes were told in detail. I hate it when action scenes aren't... I mean, that's kind of the point right? To describe action? Anyway, I had my does of action in Frost Fire and I was not disappointed. I especially loved how bloody it all was - not that it was gory or anything - it's just that it became more realistic when Drake got badly wounded or Allai got hurt and whatnot. Another thing that I liked about this book was the pacing. I liked how fast paced it was and that no page was wasted. Right from the very start, there was something going on. I admit though, part of the reason for me not getting into the book early on was because it immediately dove into the story and I didn't feel like I was eased in. But I now I just feel like it's part of the story's charm. I liked how things got so exciting at the right moments and how the twists were placed at key moments as well. Speaking of twists - woah. And that's all I'm going to say. *wink* The characters were a delight as well. I just wish I got more out of Allai. It's not that I didn't like her. I just didn't really feel a connection with her in the beginning but I guess it all worked out in the end because I enjoyed the book so much. 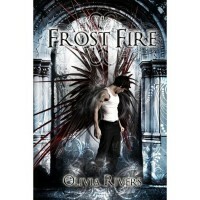 Overall I can say that Frost Fire is definitely my cup of tea. Heck, this kind of paranormal is definitely my cup of tea now. It made me like a genre that I didn't like that much and I hope you can give it a try as well (especially if, you know, you're like me pre-reading heh). You won't be sorry! :-)***I received an e-copy of this book for review***This review is based solely on my opinion.